Do start with a Cloud strategy – Define what you want to accomplish with Cloud so you can build the roadmap that takes you there. Align your Cloud strategy with your organizational strategy. Do understand the basics of Cloud technology – Be sure to research potential Cloud service providers. Hiring a Cloud advisor to help you understand vendor capabilities and services may help you achieve an independent and objective perspective. Do remember the role of change management – Cloud is not just a technology replacement activity. It will impact how you use resources in your organization, your processes, and how technology is deployed. Be sure you take into account the impact to your organization of moving to a service delivery model for technology. Do assess your current state – Take the time to understand your current environment and capabilities, and identify the short term and long term opportunities. 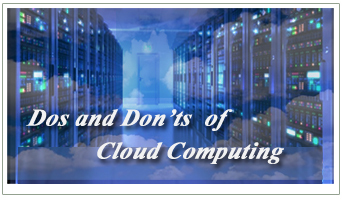 Do ensure that you have detailed plans developed before any legacy migration to the Cloud. Plans should include details around current state, and the specific steps to transition a specific legacy technology to the Cloud. Do look for some “quick wins” to create momentum – Look at DR, email, image archiving, application testing for easy wins, and to create the next Cloud opportunity. Don’t assume that Cloud is the “silver bullet” – Some assets should “not” be moved to the Cloud, at least not initially. There are multiple types of Cloud models, like private, public, and hybrid that need to be considered. Don’t be taken in by “glossy” presentations – Look for flexible approaches that don’t reflect a “one size fits all” vendor pitch. Don’t gloss over the details – Be sure to investigate architectural dependencies, systems integration requirements, SLAs, and any required user experience parameters. Don’t delay – Plan and execute Cloud, as appropriate, using a set of well-defined incremental steps. Keep in mind that this is a journey. For more information on TBI’s Cloud Computing please contact TBI or 201.573.0400. This entry was posted in Blog and tagged Cloud, cloud objective, cloud opportunities, cloud strategy, computing, don, Dos. Bookmark the permalink.